Welcome to Nashville Civil War Relics. 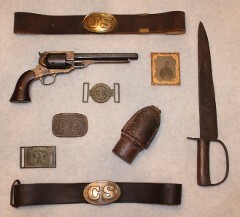 We buy and sell authentic Civil War relics and artifacts, including swords, guns, buckles, bullets, buttons, photographs, and artillery items. My name is Preston Bain, and I have been metal detecting and collecting civil war relics and artifacts for over 25 years. I decided to start Nashville Civil War Relics to offer other collectors and enthusiasts a chance to own relics and artifacts from the conflict that shaped our nation. As such, we sell a full range of Civil War artifacts, which are guaranteed to be 100% authentic. I hope you enjoy the site find a relic that "speaks" to you. Please contact me with your wish list and I will be happy to help you find that special artifact you've been searching for. Nashville Civil War Relics is dedicated to providing excellent customer service and offering a wide selection of artifacts. We are building our inventory and are always looking to purchase new and unique Civil War collectables. ** Please note that we do not have a physical location. This is an internet business only. Skip the stress of attending an auction – instead, browse hard-to-find relics from home, work, or anywhere else from your phone, tablet, or computer. 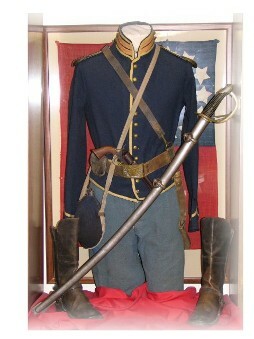 Nashville Civil War Relics makes it easy by gathering and cataloging authentic military memorabilia here on our website. Now you can explore a treasure trove of items from the Civil War, including coins, firearms, and even artillery on one convenient website – all without having to drive out to an auction and compete with other hobbyists. Looking for something specific? Let us know! We’re more than happy to help you locate rare or uncommon artifacts from this momentous time in history. Whether you’re looking for your white whale or simply looking to expand your collection, we’re eager to be of assistance, so reach out today to learn how we can aid in your search. Though all of us learn about the Civil War in school, many of us are woefully unaware of the details surrounding this unique conflict. Union soldier photos, equipment, and other artifacts can bring us closer to our countrymen and gain more in-depth knowledge about their lives and struggles.